Naturally Loyal have launched a new range of wool in 8ply - pattern prints. As you knit - the wool changes colour to form patterns. Very different from a variegated coloured wool. 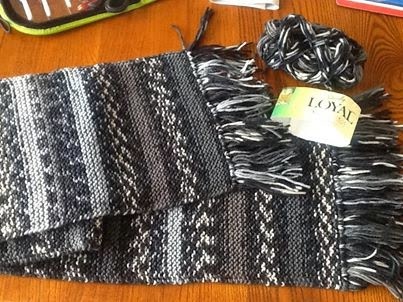 I have made this scarf for my 20 year old son. To make this I casted on 40 stitches and knitted in garter stitch (every row is knit) to give a thicker feel to the scarf. The key to having straight edges is to slip the first stitch and knit into the back of the last stitch in every row. advertising flyer - cardboard is best as it doesn't bend). Pull looped strands through edge stitch of scarf. I think each tassel should sit next to each other rather than have gaps. I'm delighted with this result. Just hope my young man likes it to.